Plenty of New 52 series that began very well unfortunately didn't finish as strongly due to the necessities of abrupt endings or departing creative teams -- Batwoman, Batwing, and I, Vampire are all examples. In comparison, while Demon Knights Vol. 3: The Gathering Storm shows a little bit of wear in the finale, it is by and large very good throughout. Even in the changeover in creative teams from Paul Cornell and Diogenes Neves to Robert Venditti and Bernard Chang, the book remains so tonally consistent that the reader might barely even notice (something that couldn't be said, for instance, about Batwing). At ten issues, Gathering Storm recaptures the sweeping, epic feel of the first volume. Fans of the old Dungeons & Dragons or Dragonlance novels that passed this series by the first time would do well to give it another look. Whether coincidentally or on purpose, Demon Knights switches from original series artist Neves to Chang at the beginning of this trade (and the start of a new-ish storyline by Cornell), and then Chang continues through the end of Cornell's run and into Venditti's. Rather than writer and artist changing all at once, so that words and pictures may both suddenly seem different, the gradual change helps blend the two runs. Even as Venditti's story takes place thirty years after Cornell's, it all feels of a piece (and it doesn't hurt that the largely-immortal cast doesn't change much appearance-wise in the time jump). 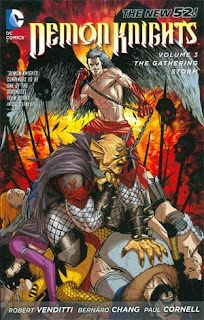 Gathering Storm is comprised of three stories: Cornell's last, in which the Knights battle the forces of Hell for control of the heavenly realm of Avalon; and then Venditti's, in which the Knights fight the vampiric forces of Cain and also try to protect the Holy Grail from rampaging giants. Of these, Cornell's is fantastic, a rousing conclusion to the story begun in the slower Demon Knights Vol. 2: The Avalon Trap, and then Venditti's first is a fine follow-up, equally exciting and equally suspenseful. It's only in the third story where Demon Knights falters a bit as the book comes to its conclusion. Cornell finishes with a pitched three-way melee between Lucifer and Hell, the spirit of King Arthur and his ghostly forces, and the Questing Queen's Horde (from Demon Knights Vol. 1). Cornell shows a knack for these kinds of prolonged action sequences, which we also saw done effectively in the first book when the Demon Knights defended a small town from the Horde. It really feels like a climax for Cornell's run, and further Cornell finally and more directly ties the Demon Knights in to Stormwatch in his conclusion. As with Demon Knights, I'm overdue to finish reading Cornell's (and then Jim Starlin's) Stormwatch, and I'm doubly interested now that I understand that Stormwatch's Adam One is a reborn incarnation of Demon Knights's Merlin. Venditti's first story does double-duty both in reestablishing the status of the Demon Knights after thirty years, and then also sending them to stop Cain, whose future self we saw in I, Vampire Vol. 2. Cornell's formal naming of the team as "Demon Knights" in the previous tale helps orient and move along Venditti's time jump, because it's not just that the Knights happen to come back together as they have an awareness of themselves as a team (and it doesn't hurt, again, that they mostly all look the same as before). Venditti uses violence well at the outset in Vandal Savage's eons-long torturing of Jason Blood, demonstrating that the book hasn't lost any of the seriousness of Cornell's run despite its constant humor. Continuity-wonk that I am, Demon Knights has always worked best for me, despite taking place in the past, when it interacts with or affects events in the modern DC Universe. Unfortunately the book never does get back around to the actual Daemonites ("Demon Knights") who murdered Merlin in the second volume, but we do of course have I, Vampire's Cain here, and also a fantastic appearance by Wonder Woman's Hippolyta (as drawn by Chang, who previously drew some Wonder Woman issues), though I do wish Venditti had included some sly nod to the future Amazonian princess Diana. Eclipso's black diamond plays a role, as part of the "Black Diamond Probility" thread through a couple of titles, though I was surprised there was not more about it as compared to Swords of Sorcery or Team 7. Venditti's second story, the last of the book, involves the Knights finally finding the Holy Grail, which they've sought on and off since the series's beginning. To that end, the story was a slight disappointment in that Sir Ystin, primary seeker of the Grail, didn't ultimately have much to do with it. Also, Jason Blood and Vandal Savage find the Grail, simply, in the hoard of treasure-hunting giants, who don't care much about the Grail other than that it's gold and shiny. Were this not the last story of Demon Knights, that Venditti brings rampaging giants on the stage is wonderfully imaginative in the style of the old table-top role playing games; as the last story, however, after Lucifer and Cain, the giants are an anti-climactic threat. Additionally, Chad Hardin replaces Chang, and the art loses detail at times (an inking issue, perhaps) and there are often too-large panels simply for a character to react to a surprise, and so on. In total, however, Demon Knights Vol. 3: The Gathering Storm does not lose cohesion in the end to the extent that other cancelled New 52 series have done. Frankly, this third book is even an improvement over the second, focusing as it does more on the entire cast instead of just the Demon Etrigan, and also with not one but two really impressive battles in this story. What "DC You" lacks right now, genre-wise, is fantasy; that's not my go-to pick, but Paul Cornell and Robert Venditti each did a nice job with it, and I'd be happy to see either one resurrect this title or do something similar. Yeah, but I don't like how this Lucifer doesn't match up with the Lucifer from Sandman and Lucifer. 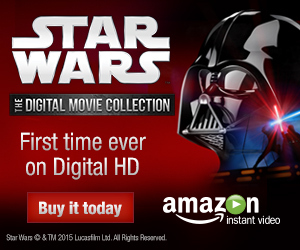 Speaking of,any chance you'll review either of those series? Lucifer is available in five 400-page volumes now. And Sandman had a (relatively) recent omnibus. Or at least the new Sandman OHC coming out at the end of this year? >> Sandman and Lucifer. Speaking of,any chance you'll review either of those series? I would say, not much of a chance. I intend to do a Sandman read-through one day, but that's pretty far off and there's a number of other classic series that I'd read through first. Lucifer's just never been a book on my radar, sorry, but that shouldn't take away from your enjoyment of it. It doesn't much bother me that the post-Flashpoint New 52 Lucifer doesn't match up with Lucifer in the pre-Flashpoint, mostly-alternate-continuity Vertigo series; I would not expect that necessarily. I did like that Venditti references some aspects of Brian Azzarello's Wonder Woman series; however, I'm not sure the extent to which Venditti's use of Cain matched up entirely with I, Vampire.